Ornithophobia! The unnatural or excessive fear of birds. This may be a malady solely created by Alfred Hitchcock’s classic film “The Birds”. 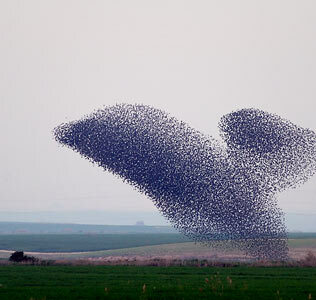 The above picture, reportedly a real photo taken in Israel, is of a flock of starlings flying in an unusual formation (dove or dolphin, maybe). On the day this photo appeared on Yahoo, we had our own bout with starlings. All of a sudden we were up to our shoulders in gangsta’ starlings raiding the dogs automatic feeder. They seem to be partial to Alpo’s Prime Cuts. While one contingent of birds would distract Buddy and Baxter another would stage a commando raid on the feeder and gorge themselves. This went on for hours. Why did we not put a stop to this you ask? Starlings always appear in brigade strength or better and if over 225 combined pounds of dogs with teeth and claws couldn’t stop it, what chance did a 140 man have. Yes Alfred we’ve seen your movie! Our hat is off to you Tippi Hedron.